Recorded @ Studio 198, Newark, New Jersey. Sleeve is a generic, slightly over-sized, white jacket with glossy printed sheets glued to either side. Copies exist that do not have the sheets affixed (generic white jackets). Pressing company uncredited, identified by the matrix etchings and generic PRI inner dust sleeve. 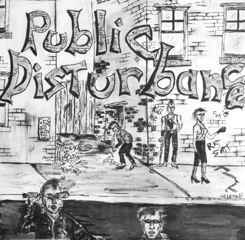 © & ℗ 1983 Public Disturbance Music.